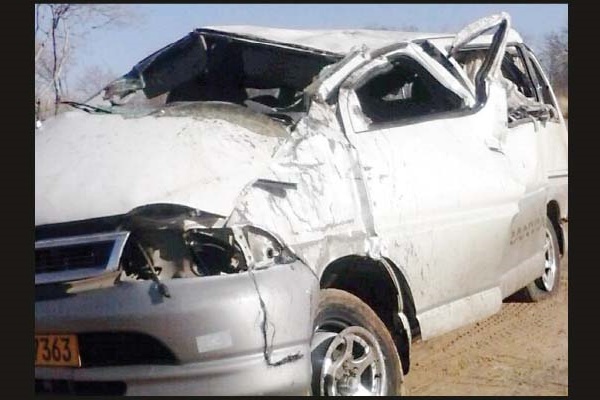 Police have proceeded to name nine of the ten people who were killed in a horror accident along the Harare-Bulawayo Road in just after Shangani last Friday. National police spokesperson Chief Superintendent Paul Nyathi yesterday said the nine had been identified by their next of kin. The nine are Mncendisi Moyo (30), Lunga Allen (25), Bongani Ndlovu (25), Sitheni Ndlovu (23), Phanuel Chikandiwa Chidyiwa (64), Preggy Chibwe (57), Sunboy Nkomo (39), Nyasha Magasa (27) and Abigail Gwezere (35). "Police are appealing to those who are missing a relative to proceed to Gweru General Hospital and identify the remaining unidentified body of a female adult of approximately 30 years of age," Chief Supt Nyathi said. The 10 died near Chalet Business Centre in Shangani last Friday at around 4pm when a Toyota Grande Hiace was travelling towards Gweru with 13 passengers on board. On approaching the 369km peg, the vehicle burst its right rear tyre, veered off the road before overturning and landing on its right side. Police said eight people including the driver died on the spot while another died on the way to the hospital. The other passenger died on admission at United Bulawayo Hospitals while three others were seriously injured and are still admitted at the hospital.